Peptide (C)KFLPLKRQAGQPS, corresponding to amino acid residues 200-212 of mouse Orai1 (Accession Q8BWG9). 2nd extracellular loop. Specificity Will not recognize human Orai1. Antibody concentration after reconstitution 0.65 mg/ml. 1-3. Anti-Orai1 (extracellular) Antibody (#ACC-062), (1:200). 4-6. Anti-Orai1 (extracellular) Antibody, preincubated with the control peptide antigen. Immunohistochemical staining of rat pancreas paraffin embedded sections using Anti-Orai1 (extracellular) Antibody (#ACC-062), (1:50). 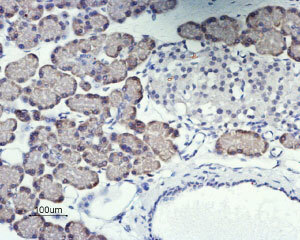 Orai1 (brown) is expressed in acinar cells. Hematoxilin is used as the counterstain. ___ Cells + Anti-Orai1 (extracellular) Antibody (#ACC-062), (10 µg/0.5 x 106 cells). Cell surface detection of Orai1 in intact living rat basophilic leukemia (RBL) cells. A. Extracellular staining of cells using Anti-Orai1 (extracellular) Antibody (#ACC-062), (1:100) followed by goat anti-rabbit-AlexaFluor-488 secondary antibody (green). B. Merge of A and Live view of the cells. Eisner, D.A. et al. (2005) Exp. Physiol. 90, 3. Chakrabarti, R. and Chakrabarti, R. (2006) J. Cell. Biochem. 99, 1503. Feske, S. et al. (2006) Nature 441, 179. Pickett, J. (2006) Nature Reviews Mol. Cell Biol. 7, 794. Luik, R.M. et al. (2006) J. Cell. Biol. 174, 815. Wu, M.M. et al. (2006) J. Cell. Biol. 174, 803. Ong, H.L. et al. (2007) J. Biol. Chem. 282, 9105. Luik, R.M and Lewis, R.S. (2007) Trends Mol. Med. 13, 103. DeHaven, W.I. et al. (2007) J. Biol. Chem. 282, 17548. Cytosolic calcium (Ca2+) has long been known to act as a key second messenger in many intracellular pathways including synaptic transmission, muscle contraction, hormonal secretion, cell growth and proliferation1,2. Intracellular Ca2+ levels are controlled by either the influx of Ca2+ through the calcium-release-activated Ca2+ channels (CRAC), or from intracellular stores which gained much attention. Recently, several key players of the store operated complex have been identified3. Orai1 (also known as CRACM1) acts as the store operated Ca2+ channel (SOC) and STIM1, which acts as the endoplasmic reticulum Ca2+ sensor3,4. The formation of functional channels requires the presence of both Orai1 and STIM1 proteins working as a complex and involves the co-clustering of Orai1 on the plasma membrane with STIM1 on the endoplasmic reticulum4-6. TRPC1, a member of the transient receptor potential family was also suggested to act as a player in the SOC complex7. In T-cells, Ca2+ entry following activation by antigen-receptor engagement occurs solely through CRAC channels where Orai1 constitutes the pore forming subunit3,8. Orai1 is a plasma membrane protein with four potential transmembrane domains and intracellular N- and C-terminus. In addition, two mammalian homologs to Orai1 have been identified; Orai2 and Orai33,9. All three, Orai1 Orai2 and Orai3, are capable of forming store operated channels with different magnitudes9. Expression of Orai1 in mouse optic nerve.A(i-iv). Immunohistochemical staining of mouse optic nerve sections using Anti-Orai1 (extracellular) Antibody (#ACC-062). Orai1 staining (green) is detected in astrocytes and co-localizes with GFAP staining (red) an astrocyte marker. A(v). Immunocytochemical staining of mouse cultured optic nerve cells using Anti-Orai1 (extracellular) Antibody, (green). Note the lack of immunostaining when the antibody is pre-incubated with the control antigen (Aiii, inset).Adapted from Papanikolaou, M. et al. (2017) Brain Struct. Funct. 222, 2993. with permission of SPRINGER NATURE. Anti-Orai1 (extracellular) Antibody (#ACC-062) is a highly specific antibody directed against an extracellular epitope of the mouse protein. The antibody can be used in western blot, immunohistochemistry, live cell imaging, and indirect flow cytometry applications. It has been designed to recognize the Orai1 channel from mouse and rat samples. Rat pulmonary arterial endothelial cell lysate (1:400). Zhang, B. et al. (2018) Am. J. Physiol. 314, H359. Mouse C2C12 myoblast cell lysate. Garcia-Castaneda, M. et al. (2017) J. Physiol. 595, 4167. Kuang, S.J. et al. (2017) Eur. J. Pharmacol. 805, 93. Zhang, W. et al. (2017) Inflammation 40, 778. Mouse pulmonary arterial smooth muscle cells. Gonzalez Bosc, L.V. et al. (2016) Am. J. Physiol. 311, L48. Lisak, D. et al. (2016) Cell Death Differ. 23, 358. Henke, N. et al. (2013) Cell Death Dis. 4, e470. Papanikolaou, M. et al. (2017) Brain Struct. Funct. 222, 2993. Zhang, W. et al. (2017) Inflammation in 40, 778. Qi, Z. et al. (2016) Cell Mol. Neurobiol. 36, 1035. Li, H. et al. (2017) Sci. Rep. 7, 226. Anti-Orai1 (extracellular)-ATTO-488 Antibody (#ACC-062-AG). A fluorescent primary antibody. It can be used in immuno-colocalization studies in conjunction with any of our antibodies raised in rabbit. Anti-Orai1 (extracellular)-ATTO-488 Antibody (#ACC-062-AG). A fluorescent labeled primary antibody. It can be used to detect Orai1 in live cells.